Milton Keynes, UK: Outside broadcast, satellite uplink, and product design specialist SIS LIVE has been supporting the BBC and NHK over the summer in their deployment of the new super hi-vision technology. Super hi-vision is one of the new technologies showcased this summer, with selected events, including the Opening and Closing ceremonies and the Men’s 100m final being broadcast live in super hi-vision at special screenings around the UK, as well as at locations in Japan and the USA. Throughout July and August, London provided a spectacular showcase and backdrop for the SHV technology, which broadcasts pictures at 8 times the resolution of HD, and delivers sound at 22.2 (compared to 5.1 surround). The quality is at the limit of what the human eye can register, so this really is the pinnacle of high definition broadcasting. Japanese state broadcaster NHK, in collaboration with the BBC 2012 team, handled the recordings, transmission and screenings. SIS LIVE has a history of collaboration with NHK and in the preparations for their project provided expert technical and logistical outside broadcast support for the Japanese NHK crew who were tasked with integrating the specially adapted outside broadcast vehicle and audio equipment shipped in from Japan. 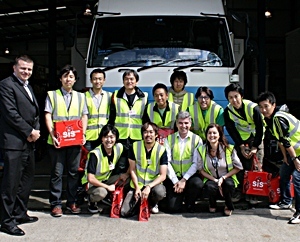 As well as moving their outside broadcast unit to various iconic locations around London, SIS LIVE has also provided dedicated workshop space and technical crew at their Langley OB base, to assist with the integration of the NHK audio equipment into a SIS LIVE audio truck which operates alongside the NHK SHV OB unit. As one of the largest and longest-serving outside broadcast companies in the world SIS LIVE was the perfect choice as a technical partner for this part of the project. NHK were able to benefit from the extensive experience of its staff, as well as a well-equipped workshop space and a highly specified audio truck.